Animal Models for Medications Screening to Treat Addiction, the latest volume in the International Review of Neurobiology series, provides a comprehensive overview of the state-of-the-art research on the topic. It reviews the current knowledge and understanding in the field, presenting a starting point for researchers and practitioners entering the field. 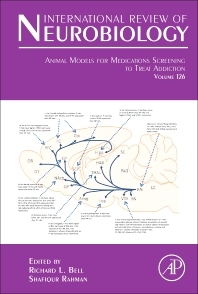 Neurobiologists, neuroscientists, pharmacologists, addiction scientists, and researchers studying the animal models and drug discovery research for drug addiction as well as clinical researchers in academia, industry or the government interested in behavioral neuroscience and/or behavioral genetics, especially as it relates to Addiction Medicine and Addiction Psychiatry. This book can be used as a reference book for medication development research in the addiction field. 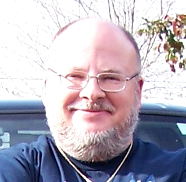 Dr. Bell received a Bachelor of Arts in General Psychology and Addiction Counseling from Minot State University (Minot, ND) and went on to receive a Master of Science and a Doctor of Philosophy in Applied Biopsychology, with a minor in Biostatistics, from the University of New Orleans (New Orleans, LA). He is presently an Associate Professor of Psychiatry at the Indiana University School of Medicine (Indianapolis, IN). He has been researching the in vivo effects of alcohol for 20 years and has maintained continuous funding from the National Institutes of Health—National Institute on Alcohol Abuse and Alcoholism for close to 15 years. His research during this time has focused on the behavioral genetics of rat lines selectively bred to consume high, vs very low, amounts of ethanol. The high ethanol-consuming rat lines display intakes corresponding with that of a 70 kg male drinking a fifth, or more, of 90-proof whiskey every day. These rat lines display many of the behavioral, physiological, neurochemical and genetic characteristics observed in clinical family history positive (FHP), for alcoholism, individuals; whereas the low ethanol-consuming rat lines serve as an animal model of family history negative (FHN) individuals. Moreover, these high ethanol-consuming rat lines meet established criteria for an animal model of alcoholism. Regarding this, he has written extensively on the genotypic as well as behavioral and neurochemical phenotypic characteristics of these and other major, international selectively bred high vs low ethanol-consuming rat lines. His more recent research has focused on three major areas: (1) innate and ethanol-induced changes in gene expression within subregions of the mesocorticolimbic and extended amygdala reward neurocircuits; (2) the acute as well as chronic behavioral and neurochemical effects of ethanol and/or nicotine exposure during adolescence and emerging adulthood; and (3) differences in the genetic, behavioral and neurochemical effects of binge-like, non-binge-like and relapse-like ethanol drinking and/or nicotine consumption. Scholastically, Dr. Bell has presented his findings to professional and lay audiences locally, nationally and internationally. He has published approximately 120 journal articles and book chapters. He serves as Associate Editor, Review Editor or Reviewer for over 50 international journals. He serves as a grant reviewer for the Veterans Affairs and the National Institutes of Health as well as multiple international academic institutions and is a member of the Research Society on Alcoholism—Animal Research and Ethics Committee. Shafiqur Rahman, Ph.D. is Professor of Pharmacology in the Department of Pharmaceutical Sciences at South Dakota State University (SDSU) in Brookings, USA. He received his Ph.D. in Neuropharmacology from the Memorial University of Newfoundland, Canada. Dr. Rahman completed his post-doctoral fellowship in the Department of Psychiatry from Indiana University School of Medicine in Indianapolis in USA. Prior to joining SDSU, he worked as research scientist and faculty at the University of Kentucky in Lexington, USA and the University of Toronto, Canada. Dr. Rahman's research focus is drug discovery in neuropharmacology, i.e. the development of novel therapeutic candidates for the treatment of alcohol/nicotine addiction and neuropsychiatric disorders using animal models. His research resulted in over 200 publications/presentations, including peer-reviewed scientific articles, reviews, book chapters, meeting abstracts and seminar presentations. Dr. Rahman served on numerous scientific review panels and editorial boards of several scientific Journals. He has authored or edited multiple books or Journals in drug addiction and neuropharmacology field. Dr. Rahman is also affiliated with a number of professional organizations, including Society for Neuroscience and American Society for Pharmacology and Experimental Therapeutics.